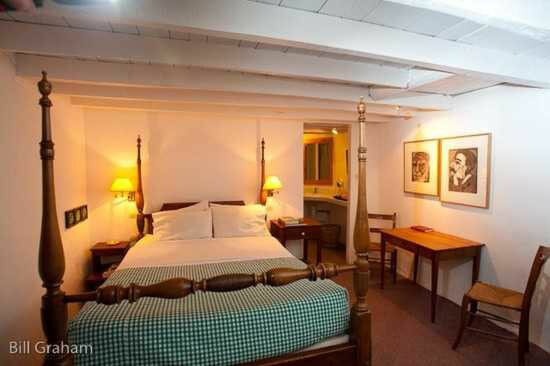 Four guest rooms for up to 10 guests. All rooms are one flight up. Two of those have double beds. One contains twin beds. The largest is the "family room" with a double and two single beds. We can accommodate a total of 10 guests. In a pinch we can deploy extra floor mattresses for children. We also have a cot/crib for the diaper set. Eisenhower room is named after John S.D. Eisenhower, military historian and son of Ike, guest for a week while he and wife Joanne were fact-checking their book "Yanks" about American participation in WWI. Chapter 13 concerns Reuilly and the Second Battle of the Marne. Twin Bed Room. I recall telling a young couple it was the last room available and though disappointed the guy said, "Don't worry, we'll just push them together." Ho, ho! When he found two heavy, antique colonial beds separated by a chimney he changed his mind. 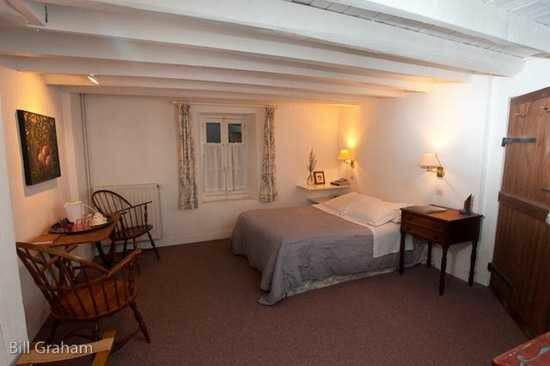 The room is, however, charming and has a ceiling I doubt you'll find in any other B&B in France. Very good reading lights too. By two sound-proof doors it can communicate with the Balcony Room. Balcony Room. It has a little balcony with view from bed onto the forest behind the house. The communicating doors to the Twin Bed Room make the two of them ideal for a family. 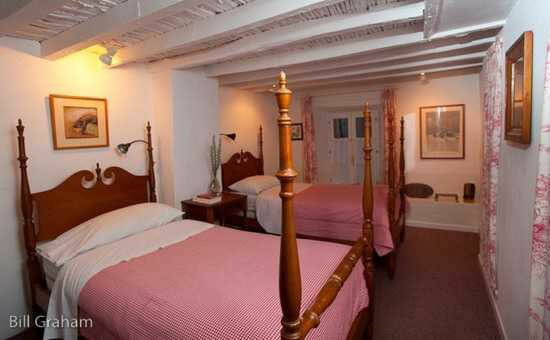 Like the twin room next door it has a colonial bed frame. It also has the oldest antique in the house, a side table dating to the Directorate period (early 1800s). New Room. We call it that because it was the last room we built. Easily our largest room, it also is called the Family Room because of its double and two single beds. It also goes by the name of "Honeymoon Room". Should I reverse those terms since normally the honeymoon precedes the family? But I'm old school.